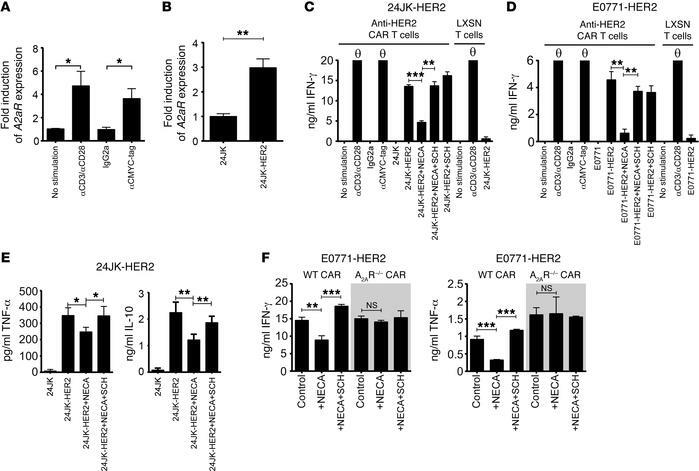 Stimulation of the CAR results in upregulation of the A2AR, which limits CAR T cell cytokine production. (A) 2 × 106 murine anti-HER2 CAR T cells were stimulated overnight with either anti-CD3 (0.5 μg/ml)/anti-CD28 (0.5 μg/ml), anti-CMYC tag (1:1,000), or an isotype control. (B) 1 × 106 CAR T cells were cocultured with 1 × 106 24JK or 24JK-HER2 tumor cells for 4 hours. (A and B) Stimulated cells were lysed and RNA isolated. Expression of A2aR and housekeeping gene L32 was determined by qPCR. (A) Data were normalized to unstimulated CAR T cells and are presented as the mean ± SEM of 4 individual experiments. (B) Data are presented as the mean ± SD from a representative experiment of n = 3. (C–F) 2 × 105 CAR T cells were cocultured with 1 × 105 24JK/24JK-HER2 (C and E) or E0771/E0771-HER2 (D and F) tumor cells in the presence or absence of NECA (1 μM) and SCH58261 (1 μM). Supernatants were collected after 16 hours and the cytokine concentration determined. Data are represented as mean ± SD of triplicates from a representative experiment of n = 4. “θ” indicates that the recorded value was above the maximum indicated on the graph. “LXSN T cells” refers to T cells transduced with the empty retroviral vector (LXSN) control. *P < 0.05, **P < 0.01, ***P < 0.001 by 1-way ANOVA; NS, not significant.